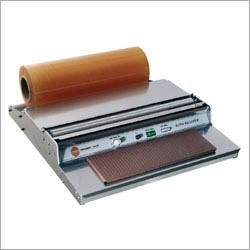 We are an eminent manufacturer and supplier of a highly efficient gamut of Cling Wrapping Machines. These machines are manufactured by a team of skilled professional who employ latest machines and tools in the development process. The offered range is originally used for producing Polyethylene Plastic Film, Cling Film and Stretch Film. The machine consist of three important parts which includes Auxiliary, Electrical Control and Host Parts. Our catered array of Automatic Cling Wrapping Machines is provided with a Die Head consisting special double flow design for making the thickness of the membrane precise and accurate. Available in varied sizes and technical specifications, these machines are widely appreciated by the associated clients. Moreover, the screws of these machines are made up of nitrated steel which further enhances the plasticizing capacity. The use of modern PID Automatic Temperature Control System in the Automatic Cling Machines accurately controls and adjusts the film thickness and smoothness. We at our end make sure to follow all the industry set norms and standards while manufacturing the machines which makes the clients completely satisfied.